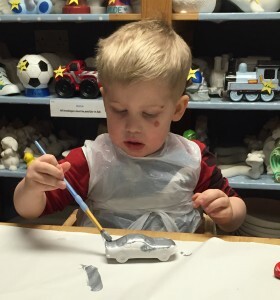 Pay just £3 for the child’s session fee (when booking in advance 24hrs+ if on the day then £4 session fee) and then the cost of the piece picked to paint (start from £1.25 upwards). The piece can either be painted in stains and glitters and taken home the same day or in the glazed colours and collected in 7 to 14 days. Soft drink for the child (and a biscuit!!! ).